The third generation (C3) Corvette was all new for 1968. The Stingray, as it was called, dawned at the height of the muscle car era. Chevy and GM had their feet firmly planted in pony car territory. But all-out muscle cars? In 1970, Chevy offered a special package on the Corvette called the ZR1. It was a high-performance package with an upgraded engine, brakes, suspension and more. For an extra $500 or so on top of that, you could’ve ordered a ZR2. The ZR2 package was supposed to be for 1970 only, but it got delayed a bit too long and is only found on 1971 Corvettes. It uses the big 7.0-liter 454 V-8 underrated by the factory at 425 horsepower. It also got power disc brakes, heavy-duty suspension, and posi-traction. The package was an additional $1,747 on top of a base Corvette and only 12 were built. 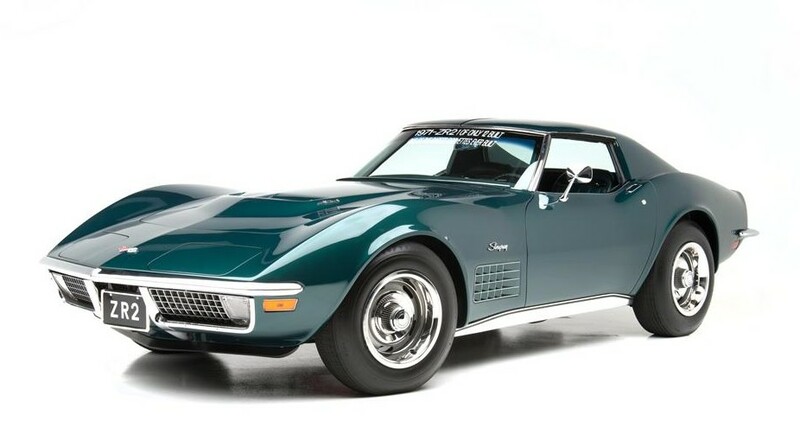 A high-performance Corvette that is one of only 12 built + a Barrett-Jackson auction in January? Yeah, that’s going to make for one expensive car. Check out more here and see the rest of Barrett-Jackson’s auction lineup here. This entry was posted in Uncategorized and tagged 1971, auctions, barrett-jackson, cars, chevrolet, classic cars, corvette, muscle cars, zr2 by classiccarweekly. Bookmark the permalink.